What Does a NASCAR Nurse Do? 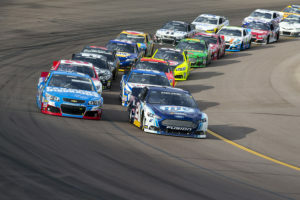 The racing industry has been under scrutiny for many years, as race fans and safety experts continue to debate about the racing rules and regulations that maintain the excitement at the track while keeping drivers safe. The 2001 death of Dale Earnhardt, a racing legend, devastated the racing community and ignited national debate over the safety of the sport. Many fans and safety experts felt stronger safety measures on the track could have prevented his death. Earnhardt died after another driver bumped his left rear fender and sent him into a wall in the last lap of the Daytona 500. This racing tactic is called "bump drafting". Bump drafting allows drivers to pick up speed by reducing drag and receiving a bump forward from other drivers. For years leading up to Earnhardt's accident, this risky maneuver had caused many wrecks on the racetrack, and it ultimately became illegal after Earnhardt's 2001 death. The ban of bump drafting was not the only change in racing after Earnhardt's sudden death. NASCAR established a safety research and development center to come up with new safety innovations to protect its drivers and viewers. Today, NASCAR continues to research ways to enhance its life-saving innovations since Earnhardt's death, including protective seats, better belt systems, window nets, head restraints, SAFER barriers, and more. NASCAR has also added new safety and medical personnel to racetracks and speedways across the country as part of the industry's continued commitment to safety initiatives designed to protect its drivers and spectators. Improved safety regulations and on-track medical personnel have created a new and safer racing industry made for high speeds and injury-free races. This is where the nurses come into play! As part of NASCAR's 2001 post-season safety overhaul, NASCAR hired several full-time medical positions, including a safety analyst and medical liaisons, all of whom play a vital role in the continued safety of NASCAR's drivers and support team. The medical liaisons work with NASCAR's three national series to collect and maintain detailed medical histories of the drivers at each race. A medical liaison coordinator is a registered nurse. They also coordinate medical services with the racetrack, drivers, crew members and local hospitals. Medical liaisons ensure an incident-free race day and build a bridge between all racing parties for effective and efficient communication in case of an emergency. NASCAR has also added safety and medical personnel to racetracks and speedways across the country, including the nursing professionals who serve as vital members of the medical team on race day. NASCAR nurses staff the infield hospital and treat drivers, crew members, officials and spectators for major and minor medical emergencies such as sutures, foreign body removal from the eye, or full-blown traumas. These nursing professionals must sometimes deal with fast-paced, intense medical situations, especially after a wreck, so they have to be prepared for these situations. Nursing professionals should have training and experience in the emergency room, intensive care, cardiac, or trauma before beginning a career in the racing industry. Flight nursing would also be a beneficial experience to have. So, if you're interested in a fast-paced, intense, adrenaline rushing experience as a nurse, NASCAR nursing might just be for you - but look out, these jobs do not come by often as they have extremely low turnover rates. It is just THAT good of a job!